I’m always a little nervous going into a sequel to a book I loved, especially when the story and characters are still fresh in your mind. Knowing you are jumping into a new adventure that can change the course of everything you know or shift the game as swiftly as the weather is sometimes a terrifying thing. 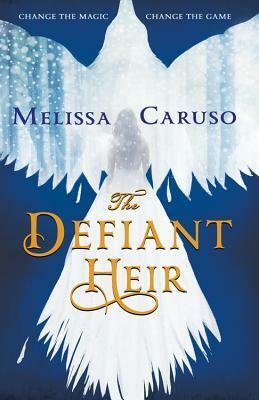 But as it turned out, I had an amazing time with Melissa Caruso’s The Defiant Heir. In fact, I pretty much couldn’t ask for more out of a sequel. In the first book, The Tethered Mage, readers were introduced to a historical fantasy setting reminiscent of Renaissance Venice, along with an irresistible cast which includes our protagonist Lady Amalia, a young noblewoman finds herself becoming a Falconer to the fire Warlock Zaira. Forever linked together by a magical bond neither of them wanted, Amalia nonetheless tries to make the best out of the situation, and although Zaira’s initial pushback was hard and aggressive, eventually she too started to come around to their new reality. Friendships, however, are not forged overnight. There’s still plenty of conflict—both individually and between them—for Amalia and Zaira to work out, and this is where this sequel comes in. The Defiant Heir continues to develop the characters’ relationship by setting them on a quest to gather information behind enemy lines, with success only possible if both women can pull all their knowledge, skills, and abilities together to work as one. All this is also set to a backdrop of imminent war, as the seventeen Witch Lords who rule in Vaskandar gather for a rare conclave in the aftermath of the events that transpired in The Tethered Mage. As the scion of one of Raverra’s most powerful families, Amalia has been groomed to take her mother’s place on the Council of Nine since birth, even though she would much rather be ensconced in a library with a pile of books or tinkering with new contraptions in a workshop. But now the time has come for her to formally enter politics and take on the responsibilities of her role as La Contessa’s heir, even if it means giving up the things she loves. I’m a big fan of stories that put characters to the test, because they always have the most compelling conflicts. Which path will a person take when faced with life-altering choices? Do they follow their sense of duty or their heart? What lengths will they go to achieve their goals? For Amalia, life has changed a great deal ever since becoming a Falconer. She has made a new friend in Zaira, even if that friendship is still complicated and somewhat precarious. She’s even found love with her fellow Falconer, Lieutenant Marcello Verdi. But as mad as they are for each other, a future together just isn’t in the cards, and that was even before Amalia decided to increase her efforts to follow in her mother’s footsteps. As the daughter of La Contessa, she must put the needs of the country before her own desires. And if her country needs her to play spy and court alliances, she’ll have to do that too, even if those duties require her to serve beyond her experiences and limits. Amalia, however, is not the kind of person to give up when the going gets hard, which is what I loved about her character in the first book and she continues to show the same kind of persistence in The Defiant Heir. She’s also measured and calculating, preferring to keep all her options open, even if it does leave her personal life a bit of a mess. That said, it’s wonderful to see a flawed but genuine and intelligent female protagonist who displays such strength in the face of crushing social pressures, and still be a good, kind, and sincere person. But once again, Caruso shows that her greatest strength is writing relationships—and a good thing too, since each and every single one of the story’s multiple threads have a basis in the character dynamics. Amalia loves her mother and wants to please her, which fuels her determination to be a good heir. She loves Marcello, but must put her feelings for him aside to allow herself to be courted by Kathe, a Crow Lord who is debonair and charming, but still pragmatic enough to understand how such a relationship would serve both their purposes. Then there’s the Falconer-Falcon bond between Amalia and Zaira, which has developed into something much deeper and more complex. They’ve put their lives in each other’s hands, and both women have learned to trust more because of it. Zaira has even let herself open up and grow closer to Terika, another Falcon. This particularly sideplot has expanded the scope of her character in many ways, showing a side of the cantankerous fire warlock that we’d only begun to explore by the end of the first book. All these relationships were woven together to form an intricate web of personal stories within a greater narrative, which made this book a joy to read because we got to watch each character grow. Fans who enjoyed Caruso’s debut will find even more to please them in The Defiant Heir, a sequel that further explores the world and all the characters we’ve come to know and love. In addition, it’ll take us to new locales and introduce us to new players, adding even more depth to series. With this second volume of Swords and Fire, Melissa Caruso is well on her way to making a very big splash in the fantasy genre, and I can’t wait for the third book to get here. Yes, after this, I know Caruso has a winner on her hands. Look out, fantasy, here’s a new author to watch! Yay! I was debating reading this sequel, guess I have to haha. I’m always scared of sequel too! Definitely a series to keep an eye on! I’m all about characters and relationships too, and I’m glad this series focuses on both. By the whole premise of the series I know it isn’t for me. But that way I can simply enjoy reading a review about a book that someone else enjoyed immensely. I hope this stays as good for you. Yeah, I can kinda see this one not being to your tastes, lol! Some books just have that special something about them though, that really appeals to me. Glad to see you enjoyed this one too! Yeah, it was wonderful. Looking forward to book 3 now! Thank you! Orbit has been coming out with many great series from debut authors lately. Melissa Caruso will be another new author to watch!